NOTE: Screenshot is out of date. WIll get it updated when I get a chance to get in game. In the meantime if you visit the Serenity release thread indicated at the bototm of this info you can see newer screenshots. Please use the following thread for any problems or issues regarding the beta release of this UI. Feel free to post positive or negative comments here, but any problems and troubleshooting should be restrained to the followng thead. Thank you. - Fixed bug with vertical sizing in target, implied target, and player windows that had percent labels. Beta 3 of Serenity introduces a bunch of fixes, a few changes, and some new windows. - Changed behaviour of the hotkey window once again. The left border frame is now a button that toggles the selector page on and off. For more info, look at the useage instructions at the bottom of this document. - Added various stat strips. For useage see the Serenity useage instructions below. Beta 2 of Serenity brings a bunch of fixes, changes, and some more refinement to the core interface. - Modified bank page function on the hotkey bar. The bank selection page is now only visible when you turn FRAMES on for the hotkey bar, and invisible when FRAMES are off. When turned on the bank page sits on top of hotkey #1 which allows the window to eliminate dead space. While turned on you will not be able to use the mouse to click hotkey #1. Instead this area will let you move the window around. - Fixed a bug in the journal (quest) window that prevented the CLOSE and SETTINGS buttons from working. - Fixed a bug with the bag window that prevent more than 12 slots from showing properly. - Fixed a bug that prevented the HUD Slider window from openening. This caused a black uncloseable window when attempting to resize hotkey icons. - Reworked paradigm for Target and Implied Targwt window sizing. The windows when manually sized would always reset when a new target was chosen. Therefore the manual sizing was replaced with an autosizing function. In the upper right corner of the window is a checkbox to toggle the display of target effects. The window will autosize itself appropriately based on whether or not effects are turned on and even based on how many effects there are. - Reworked PRogress bar gauge styles and concentration bubble gauge styles to be more space efficient while retaining the same look and feel. - Totally new Player, Target, Implied Target, and Experience windows using the new gauge styles. - Provided various ALTERNATE styles of Player, Target, and Implied Target windows. NEW ALTERNATE WINDOW STYLES TO CHOOSE FROM! The player window has 4 seperate alternate styles you can choose to use. Once you have unzipped Serenity you will find 4 player window zip files, one for each style. By default Serenity will use the Player_Percent_NoInfoblock style. If you wish to use a different style, simply unzip the appropriate zip file and overwrite the player window with the one from the zipfile. The styles are detailed below. This style has percent labels on the progress bars, and the character's name at the top of the window. In addition the window can be resized to the right to bring the percent labels off the progress bars. This style has no labels on the progress bars, and the character's name is at the top of the window. This style has percent labels on the progress bars, and the character's name at the top is replaced with an infoblock which has text labels indicating current/maximum health on the left and current/maximum power on the right. In addition the window can be resized to the right to bring the percent labels off the progress bars as well as reveal a current/maximum concentration value in the infoblock between the health and power labels. This style has no labels on the progress bars, and has the infoblock on the top of the window. The infoblock functions identical to the Player_Percent_Infoblock style. The Target and Implied Target windows have 2 seperate alternate styles you can choose to use. Once you have unzipped Serenity you will find 2 target window zip files, one for each style. By default Serenity will use the Target_Percent style. If you wish to use a different style simply unzip the appropriate zip file and overwrite the target and implied target windows with the ones from the zip file. The styles are detailed below. This style has the percent labels on the progress bars. In addition the window can be resized to the right to move the labels off the progress bars. This style has no labels on the progress bars. The statbars have two layouts (horizontal/vertical) which can be toggled in game. If you wish them to default to one layout or another each time you start the game, simply unzip the appropriate zip file and overwrite the files as prompted. The default is the StatBars_Horizontal style. This style causes the statbars to default to a horizontal layout. In this layout the information flows from left to right accross the screen. This style causes the statbars to default to a vertical layout. In this layout the information flows from top to bottom down the screen. Useage instructions for the more advanced Serenity windows. The Serenity experience window is a special 3-way window which can be configured as desired to show Player Experience, Guild Experience, and/or Tradeskill Experience. You can show any combination of the 3 that you desire. To show Guild Experience simply resize the window to the right to reveal the guild experience. To show the tradeskill experience simply resize the window downward to reveal the tradeskill experience. When using the bottom tradeskill gauge it is recommended that you right click on the adventure exp and select the DO NOT CHANGE WHEN YOU GAIN EXPERIENCE option so that the top gauge will remain as advanture exp and not switch to tradeskill exp. The window can be resized in both directions to show all 3 gauges, or in just one direction as desired. The serenity inventory window is a powerful docking window. It allows you to toggle the window between a full size and a docked state with just one mouseclick. The fullsize mode will show all inventory slots, bags, coin, and weight information. The docked state will show only the bags, primary, secondary, ranged, ammo, food, drink, and charm slots along with coin information. To toggle states simply click the checkbox at the bottom left of the window. In addition you can set the location where the window docks to. To do this, simply click the buttom on the bottom of the window to open a positional dock window, then place this window where you want the dock to be. Lastly click the button in this positional window to close it. Now whenever you dock the inventory window it will go there. The full size window saves its own position as well so you can have the dock in one place and the fullsize window in another if you desire. Serenity includes target and implied target windows that make showing and hiding target effects a breeze! When you mouse over the window a checkbox will appear in the upper right of the window. Check that box to show effects, uncheck the box to hide effects. The windows will automaticly resize downward to accomdate the effects. It even is smart enough to only resize just enough for the current row of effects on the target. Therefore if your target has say 3 effects it will resize just enough to show those effects. 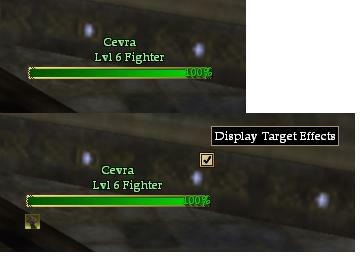 IF the target has 30 effects it will resize larger to show them all. No messing with manual resizing, no having to dig through the otions screen for the toggle. Quick and easy In addition to this autosizing, the window can be manually resized to the RIGHT when using the Target_Percent style (default) to move the percent labels off the end of the health bar. The serenity player window can be resized in various ways to modify the information display. First, as with the target windows, if you are using one of the Percent style player windows you can resize the window to the right to move the labels off the edge of the health and power bars. Also the window can be resized by dragging the bottom frame to show or hide the last 2 rows of the window which are Effects on the Player (bottom row) and Concentration bubbles (second to last row). The hotkey bar has a special bank selector page that can be toggled off and on. First off, this window is designed to have the frames turned on at all times. It isn't an absolute requirement but it will work better and look better if you turn frames on and leave them on. You won't really notice them being in the way, I promise Give it a try. To toggle the bank selector on or off, simply mouse over the left edge of the hotkey window and you will see the left border glow. Click here to toggle the bank selector. The bank selector is arranged horizontally which allows the hotbar icons to be set at the absolute smallest size and still not cause a problem. To move the window, simply drag it either from a blank hotkey spot (easiest) or from the small deadspace between hotkey slots. The startbutton for Serenity is more than just one semi-useful button. To the right of the Startbutton are 4 smaller iconic buttons which provide very useful features. Simply mouseover each to see what it does, and click the buttons to toggle thier state. In addition the Startbutton doubles as a sort of "Control Panel" for some of the more advanced CUSTOM windows in Serenity. In the upper right of the Startbutton window is a small square button. Clicking this button will expand or contract the control panel portion of the window. Simply expand it, turn on the windows you want to turn on, then click it again to contract it. Serenity contains a number of custom windows which are commonly known as "Statbars". They are small windows with text/iconic indicators for various character and game stats which would normally be found in other places. These provide the player with the ability to have certain desired information more easily available. To open any of the statbars, use the Starbutton control panel as explained above. Most statbars have two layouts, horizontal and vertical. To toggle between the two layouts use the small button in the top right corner of the statbar. 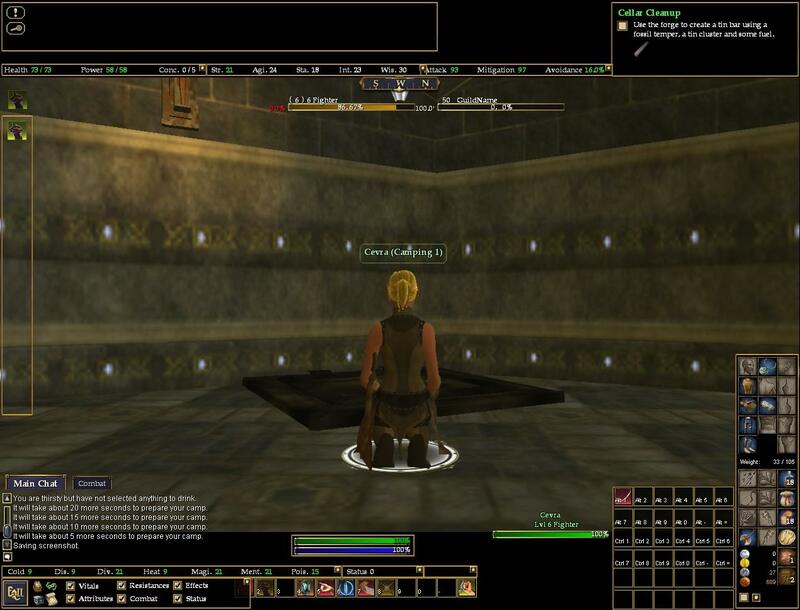 NOTE: Because these are custom windows, the EQ2 client will not save thier state between gaming sessions. That means that when you log out and back in, they will all be turned off and back to thier default layout (but the position IS saved). Simply open the control panel and toggle the ones you want back on. The control panel was designed to make this quick and easy. Unfortunately this is a limitation of the EQ2 client. Oops maintenence release. Accidently included some other stuff in the archive I shouldn't have making the download huge. The Serenity UI Suite is designed around the basic look and feel of the default UI, but designed to be more powerful and efficient, while being allowing the main "always open" windows to be less obtrusive to the play experience. It is however now being released in a BETA state. The UI is not finished but is fully useable and should not cause any issues with play, as there are no unfinished or obviously broken windows. However with that said, there may very well be bugs or other problems that I have not found, so please give it a try and let me know what you think and if you find any problems. I love this ui! I hope you stick with it, because this one finally works for me. minimalistic and I can get everything to where i want it. The screenshots included are now more up to date. If you visit the linked thread there are more current screenshots. I will get more current screenshots into this post tonight. I wont download anything that doesnt have a current screenshot. Sorry just personal preference I guess. You're absolutely right. I really do need to get some more screenshots up here. I just keep spending so much time workign on it and forget to take screenshots lol.